This time it's me who's doing the giveaway. No special reason beyond the fact I think I actually have too many books to use in collage. I'm sure y'all are going to tell me that's not possible, but my storage is limited and variety is good. 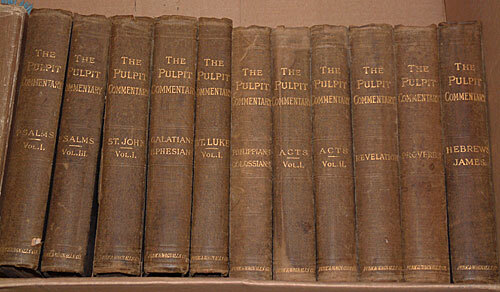 I'll send three people one volume each from this "Pulpit Commentary" series. All you have to do is leave a comment by September 20 (closes at midnight PST) and tell me what one art supply item do you have too much of, and why? Blog about this giveaway and comment again (with a link to your blog post) and you get another entry! Oops! Forgot to say that I blogged it too! Only one!well on checking out the craft room I have too many cross stitch kits, mainly because I buy them when there is a sale but just haven't got to do all.Kids will have fun when I fall off the perch.Much love. I have too much fabric! (I don't really sew, just a little and I still have odds and ends of fabric I just couldn't pass up! I have too much lace and trim and vintage sewing notions. I collect them and now my friends pick them up for me too. Way too much. Ironically, I have too much old paper... but I still would LOVE to win!